This extraordinary small SmokePump delivers. Weighing only 90g, it still has a flow rate of 600ml/min. The diameter of the SmokePump is only 27mm, its length 50mm. You can easily attach the SmokePump to your model using only two screws. The input signal will come from the SmokeDriver, so there is no need for additional programming. The pump housing and lid are made of Al Zn Mg Cu. 1,5, usage for aircraft construction for high stress parts, hardness Brinell 140. Cog wheels made of Ms 58 / CuZn 40 Pb 2, mounted swimming in the box, not pressed, hardness Brinell 95. Seals Viton von Du Pont, up to +200°C, resistant against all hydrocarbons. This is an extraordinary small and lightweight SmokePump for use in any smoke device. Its flow rate is up to 600ml/min at 6V and 3A. This especially small PumpDriver packs a punch. 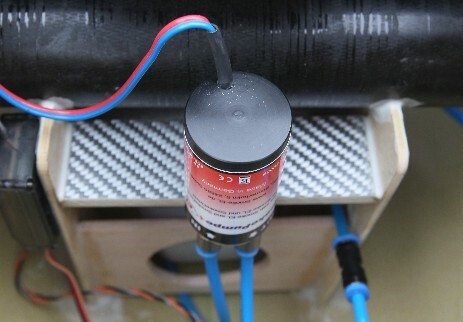 Weighing only 19g it supplies the SmokePump directly from a 2S-LiPo battery or the PowerBox. To connect the PumpDriver with the receiver, you simply need one free channel. Please choose your battery connection. 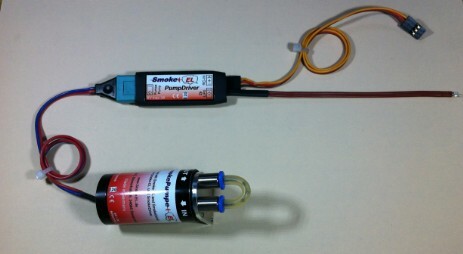 The Set includes the SmokePump with PumpDriver and 1 liter RedOil (air). You only have to add the Tank and the house connector to the exhauster.